Oil markets continue trading without direction after two days of mild trading. WTI Crude shed a light 15 cents yesterday, with markets appearing comfortable for the time being with a trading level between $56-58. Markets have not traded this high in years, and high volumes and length in the market are helping to support prices. Crude prices this morning are $56.87, a meager gain of6 cents since yesterday’s closing price. Refined products have been mixed, with diesel trading extremely flat while gasoline saw large gains yesterday. Diesel prices were virtually unmoved yesterday, opening at $1.9215 and closing at $1.9216, though prices traded in a healthy four-cent range during the day. This morning, diesel prices have gained .7 cents to trade at $1.9286. Gasoline, on the other hand, saw large gains yesterday, picking up 1.5 cents (0.8%) to close the day above $1.82. Prices could not maintain that level, and have fallen .33 cents to trade at $1.8180. The EIA’s bullish inventory report yesterday helped to keep prices elevated, particularly gasoline prices. 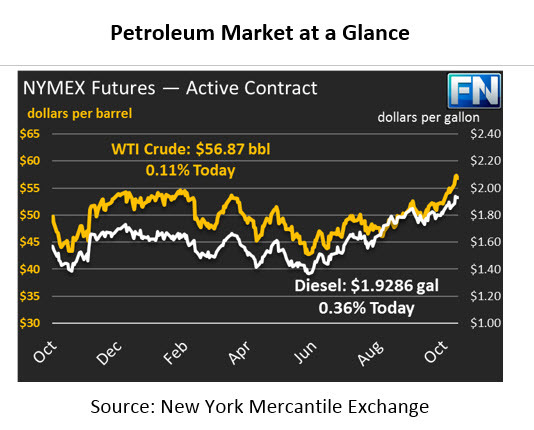 While crude did show a surprise build, markets focused more on the combined 6.7 million barrel draw coming from refined products, which more than offset the crude build. Crude exports were more than 1.2 million barrels per day lower than last week’s numbers and the lowest export statistic since Hurricane Harvey disrupted export facilities. Experts are pointing to logistics concerns that will smooth out in coming weeks, bring exports higher again. The fact that 8.4 million fewer barrels of crude were exported this past week puts the small 2.2 million barrel build in perspectives. OPIS expects export numbers to be choppy for the rest of the year, but the trend will be closer to last week’s high above 2 million barrels per day. It’s easy to become fixated on current inventory tightness, as it puts an immediate squeeze on prices, but long-term projections from the EIA show more positive signs for consumers. 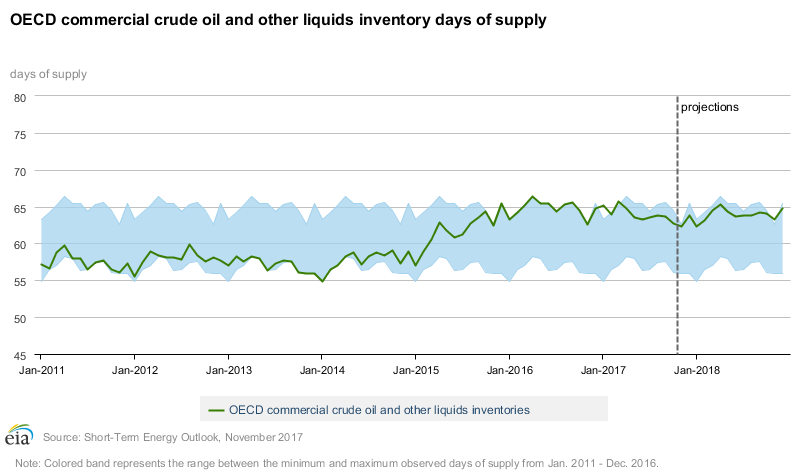 Oil inventories in OECD nations certainly have declined this year, falling from above 65 days of supply down to 63 days currently and forecast to fall to 62 days in January 2018. However, inventories are set to begin rising again in 2018 as more production comes online in the U.S. and OPEC struggles to keep nations in compliance with the production cuts. Higher inventories mean less supply concerns, leading to better prices for fuel buyers. Of course, if OPEC extends and/or deepens cuts, inventory forecasts could become less bright in 2018.